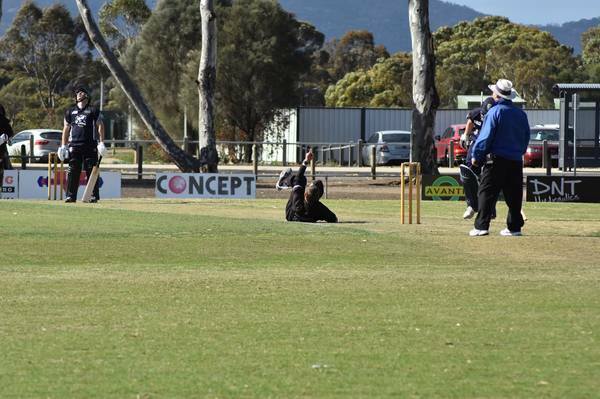 AGONY AND ECSTACY: Lara batsman Rob Sodomaco despairs as North Geelong's Sean McGrath celebrates a spectacular caught-and-bowled last weekend. Geelong Cricket club continued its impressive start to the season with a fighting victory over Greenvale last Saturday. The Cats went in without skipper Eammon Vines whose good form had resulted in a call-up to the Victorian side. Batting first, Geelong could manage just 142 as Angus Boyd top scored with 27 ande Josh McDonald made 23 at the top of the order. In reply, Greenvale looked like cruising to an easy win when at 2/82 but it was game on when Hayden Butterworth (2/14) struck a double blow. From there Brenton McDonald (4/22) and Dom McGlinchey (3/24) took complete control of the game, dismissing their host for just 122. That puts the Cats side at three wins from four starts. They take on second-placed Melbourne University this round in a two-day game and, in the form they’re in, will be relish the prospect of playing one of the top sides and showing they mean business. In Geelong Cricket Association, South Barwon ended up cruising to victory against Grovedale in the completion of the only two-day game of the round. Resuming at 3/47 in pursuit of the Tigers’ 111, Jack Spence (50) and Jordan Rossi (46) stood up and proved that the Swans might finally be spreading the load a bit more. It must be said, though, that it was a fortunate toss to win for the Swans because the conditions were markedly different over the two weeks due to the weather on day one. With better weather predicted this week, all sides should get the opportunity to play the longer form. The game with the most intrigue looks to be at Osborne Park where a winless North Geelong hosts undefeated Newtwon & Chilwell in a huge match for both sides. A loss for North Geelong would make its finals chances look very slim while, on the flip side, if the Two Blues can win again they will give themselves some breathing space from the rest of the pack and go a long way toward booking their spot in March action. Selections: GROVEDALE v Lara, Bell Post Hill v SOUTH BARWON, EAST BELMONT v Leopold, St Josephs v GEELONG CITY, North Geelong v NEWTOWN & CHILWELL. Division two has completed four rounds of one-day matches and now moves into the first two-day part of the schedule. All games on paper look very even, although the clash at McDonald Reserve between Highton and Bell Park might tell us the most about where both sides are at. Both the Heat and the Dragons are yet to find their best form so far this season, with each side suffering a disappointing loss before bouncing back with strong wins last week. Bell Park certainly looks a better side with the Lymer brothers Michael and Shane back, Michael in particular proving the key last week and he took 4/7 in a low-scoring game against Thomson. Highton’s win over Murgheboluc was probably more impressive, though, and will be a good chance to cause an upset if it can continue that form. Selections: THOMSON v St Peters, HIGHTON v Bell Park, Manifold Heights v MURGHEBOLUC, Marshall v TORQUAY. And in division three, newcomers Teesdale and Bannockburn have both hit the ground running. Bannockburn has won all three of its games so far, the Bulls adapting to turf cricket brilliantly, particularly considering they’re yet to play a home game and won’t do so for the next three games. They travel to Alexander Thomson this round in what might prove to be a sterner test. Meanwhile, Teesdale, despite losing round one, has begun to hit its straps, claiming a thrilling outright win against Guild Saints last round. Teesdale takes on Modewarre away this Saturday, with Modda also should providing a stiffer examination of Teesdale’s skills at this level. Selections: MODEWARRE v Teesdale, Corio v ST ALBANS BREAKWATER, Waurn Ponds-Deakin v GEELONG WEST, Alexander Thomson v BANNOCKBURN, GUILD SAINTS v Newcomb & District.